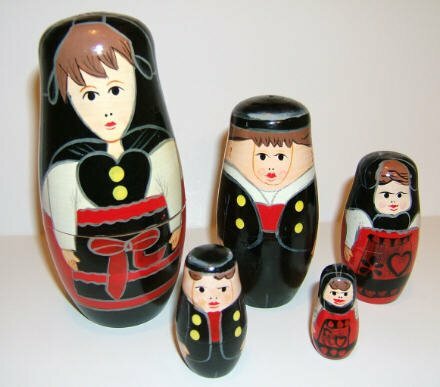 This is an "Alsacian" nesting doll sold in France, but probably made in China. The dolls wear traditional costumes from that region. A freind originally found a doll like this in France and sold in a box on which was written in the French language: “Imported by GEDIF, 25250 L'Isle sur le Doubs”. However searching their web site, she didn’t find anything about nesting dolls. This doll was a second copy that she found in a flea market in 2008 in Alsace France.